I love stripes. They are bold and graphic in any size or combination. They can be modern or classic, it just depends how you arrange and color them. Small or large, vertical or horizontal, straight or curvy, there are just so many ways to do stripes! 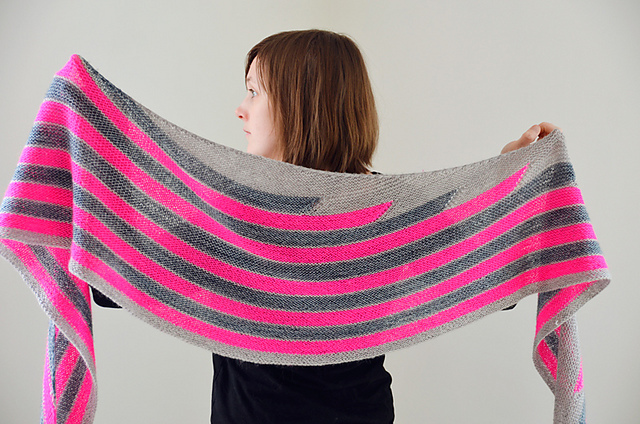 One of my favorite designers, Veera Valimaki offers several great patterns with a decidedly stripey theme. With warm weather here I’m ready to cast on for a stripey shawl! Stripes offer a a great opportunity for color play as well. Mixing and matching can be so much fun. You can go with a neutral palette, a strong punch of color, or even varying shades of the same color (greeny blues anyone?). Each of these shawls are worked with some short rows and some great color choices. You can knit one in any weight, but I’m thinking sock for mine….definitely some Tosh Merino Light. Check out our selection of bold colors for the season, perfect to punch up any outfit! This entry was posted on Sunday, May 5th, 2013 at 10:54 pm	and is filed under Uncategorized. You can follow any responses to this entry through the RSS 2.0 feed. Both comments and pings are currently closed.